As the opening of Interstate 11 edges closer so does the presentation to City Council on the proposed Hoover Dam Gateway project for the interchange with U.S. Highway 95. GC Garcia GC Garcia's map of the land surrounding the future interchange of Interstate 11 and U.S. Highway 95 shows possible zoning and uses for the area. 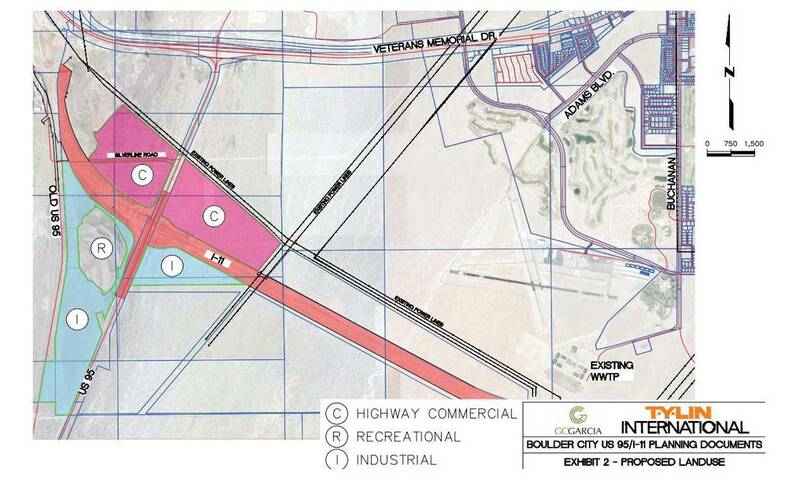 GC Garcia This map of the area surrounding the future interchange of Interstate 11 and U.S. Highway 95 presented to the city by GC Garcia shows acreage of the areas that could be developed and distances from existing roadways and structures. The Hoover Dam Gateway is a plan created by GC Garcia, a Nevada-based land planning and development services firm. The city hired GC Garcia in August 2016 for master plan services that would serve as a starting point for developing the interchange area. At some point when the City Council deems appropriate, it will initiate a master plan for this subarea of the city, similar to the Bootleg Canyon subarea plan, according to a staff report presented to the Planning Commission when the study was first unveiled in April. 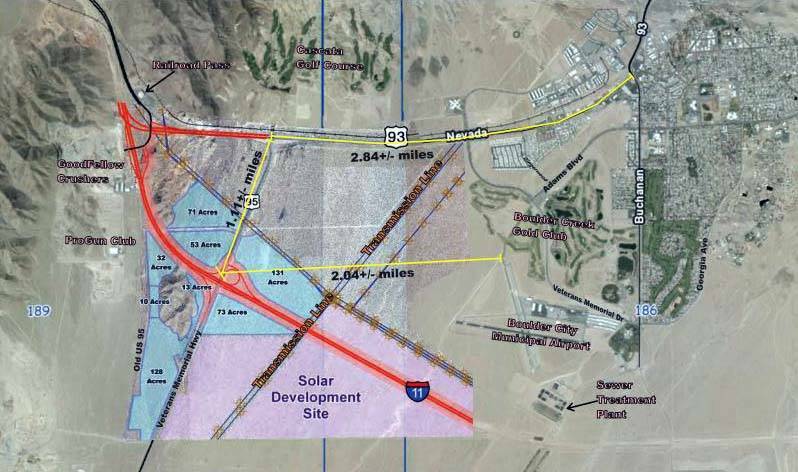 The gateway plan includes the Hoover Dam Gateway Center at Boulder City and gives different development ideas for the area, located 4.5 miles outside of downtown and almost 3 miles away from Adams Boulevard, the closest access point to existing city roads. “GC Garcia was hired to help create a plan analyzing the many economic opportunities and corresponding challenges that are likely to occur in connection with the opening of Interstate 11 next year,” said city spokesperson Sue Manteris. GC Garcia’s plan focused on potential land uses, connectivity, design guidelines, future zoning, financing and implementation strategies. It included preferred and nonpreferred uses for the 700-acre parcel, which were determined after individual meetings with key community members, as well as a town hall meeting to help define the best uses for the area with input from citizens. Ideas proposed for the area were warehouse distribution, technology parks, corporate parks, data centers, industrial parks and a visitor center; there was opposition, to workforce housing, casinos, heavy industrial and big box retail shopping. Acting City Manager Scott Hansen said although the agenda has yet to be completed, the gateway study will most likely be presented to the City Council at its Aug. 22 meeting. Hansen said that there is no formal action being requested, and council members may or may not provide direction to staff. Community residents have voiced their concerns about the project, believing that development in that area would create a second city center that would harm existing businesses. “I think that if it looked anything similar to what to what we already have on Industrial or Foothill roads, I don’t think it needs to be down there,” said resident Nate Lasoff at the Planning Commission meeting in April. “I just think it’s our value in Boulder City that we have this nice small town, and that’s what we like, and that’s why we’re here, and doing this development will open the door to ruining that and turning us into Henderson,” Mary Venable said at the meeting. Two residents, Tom Clements and Neal Siniakin, created a program for Boulder City Television expressing their concerns and opinions about the gateway. Clements said that he didn’t think the city should rush into a massive commercial and industrial development at the Hoover Dam Gateway Center. He also thinks that the gateway is a “leap frog” development that should be discouraged and agrees that it could create a second downtown for Boulder City that will cannibalize existing businesses. Both portions of the program can be found at on YouTube at http://bit.ly/2uWwHoU. The cost of the contract with GC Garcia has also been questioned. The company was one of five that submitted a bid for this project, and its base bid of $147,000 was the second to lowest. The highest bid received was $489,400, and the lowest was $123,100. The city’s budget for the project was $180,000, which came from the Redevelopment Agency. The extra money allowed for additional services from GC Garcia, if needed. To date, the city has spent $170,664.19 with GC Garcia for master plan services, according to Finance Director Hyun Kim. While the opening of the interstate and interchange may seem far off, the next few weeks will see portions put into use. Nevada Department of Transportation Public Information Officer Tony Illia said the Phase 1 southbound lanes near Railroad Pass are scheduled to open Aug. 15, while the segment of I-11 with the interchange is scheduled to be completed in January 2018.